Your little baby girl will look so sweet in Sweet Princess Bowtique's collection of infant baby hats! Our styles include hats with unique flowers and exquisite appliqués! 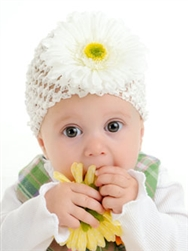 Our baby hats are made with 100% super soft cotton and are lightweight for year round wear! Sweet Princess Bowtique's infant baby hats make perfect shower gifts! Sweet Princess Bowtique...expect the BEST for your little princess! !